Finely chop enough lemongrass stalks to measure 4 teaspoons. Cut remaining stalks in half. Place beef and stalks in a large pot. Add broth and water, bring to boil. Reduce heat, simmer 1 1/2 hours. Heat oil in medium skillet over medium heat. Add 1/3 of sliced onions and garlic, saute 1 minute. Add sambal oelek, paprika and chopped lemongrass, saute 1 minute. Add sambal oelek mixture to the soup, mix in fish sauce, sugar, shrimp paste and salt. Simmer until beef is tender, skimming foam from surface, about 1 hour. 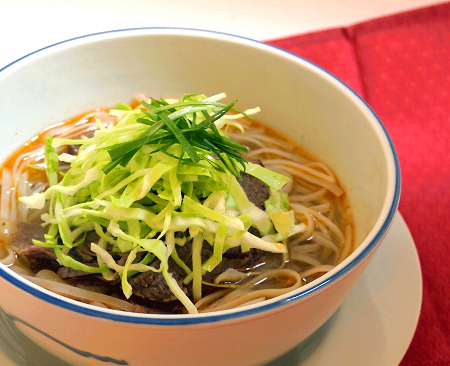 Remove beef from soup. Skim fat from surface of soup. Simmer soup until reduced to 8 cups, about 10 minutes. Add more sambal oelek for spicier flavor. Trim off any fat from beef, cut meat in bite-size pieces. Bring large saucepan of water to boil, add noodles and boil 1 minute. Drain, rinse under cold water. Using scissors, cut noodles crosswise. Divide noodles among 4 bowls. Top with beef, remaining sliced onions, green onions and cilantro. Bring soup to boil, ladle over noodles. Toss cabbage and rau ram in small bowl, sprinkles over soup. Top with chillies , if desired, squeeze lime over.